Green Imaging Technologies offers a patented, exclusive capillary pressure (Pc) measurement called GIT-CAP. Capillary pressure is a critical parameter for the oil exploration and production industry and is a common measurement performed in core analysis laboratories. However, traditional techniques such as porous plate, centrifugation and mercury injection are laborious, time consuming and expensive. 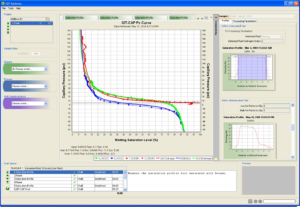 The GIT-CAP method directly measures the water saturation distribution down the core after centrifugation using a one-dimensional NMR profile. This allows users to collect 30-40 data points per spin.